In September 2018 DOF Subsea Norway AS (DOF) was awarded the contract for Statens Vegvesen (SVV) to perform geophysical mapping of a 5km2 area in Bjørnafjord in Norway. The project was executed using the HUGIN AUV “Chercheur” owned and operated by Canadian company Ocean Floor Geophysics Inc. (OFG) in combination with the small survey catamaran “GeoCat” owned by DOF Subsea Norway AS. The aim of the work was to obtain the necessary basis for engineering design services for a bridge over Bjørnafjord in connection with the “Ferry Free E39” project. The assignment included complementary high-quality geophysical surveys, (bathymetry, shallow seismic, and side-scan sonar) in order to provide SVV with detailed high-resolution geophysical data in an area approximately 5.5km long by 800m wide. The project was planned as a low logistics shore-based launch of an AUV, supported by the small vessel equipped with a system to provide positional updates to the subsea vehicle, eliminating the requirement for traditional ROV and an offshore sized vessel, but still providing the high data quality associated with the survey systems of the Hugin class of AUVs. The AUV containers were set up at a suitable quayside location, where a storage area and processing office were also established and project personnel were accommodated in a hotel nearby. Working only during daylight hours, the data was collected in less than a week. In addition, detailed acoustic surveys were carried out at a selection of possible anchor locations to discover any objects with a diameter of 0.5m or more that could possibly obstruct the placement of anchors. And, when the AUV was not permitted to navigate between the anchors of an existing fish farm located in the survey area, Geocat’s hull mounted seismic equipment and multibeam echosounder were used. In all, 180km of data was collected safely and efficiently with a state-of-the-art AUV survey suite including multibeam bathymetry (MBES), sub-bottom profiler (SBP), sidescan (SSS) and synthetic aperture sonar (HISAS). The advanced terrain following algorithms of OFG AUV Chercheur allowed for excellent data quality even in the very rough, undulating and rocky terrain varying from 40m to 560m water depth, with slopes exceeding 60 degrees. Seismic data is particularly of great importance to the customer when it comes to bridge engineering and DOF received highly positive feedback from SVV on the high quality of the data provided. Figure 4 Shallow seismic vertical profile, showing sediment deposits on top of bedrock. Figure 5 HISAS image of 15 metre long wreck resting on exposed bedrock. Commenting on DOF Subsea’s survey method and performance Tore Thomassen, responsible for seabed conditions on The Fjord Crossing Project, Ferry Free E39, said, “In connection with the geophysical investigations needed for Bjørnafjord, Statens Vegvesen Region Vest, chose to go with an unknown and previously untested method for this type of topographically very challenging terrain. In competition with more traditional geophysical and tested methods we chose to use an AUV as it was offered by DOF Subsea Norway AS in cooperation with Ocean Floor Geophysics Inc. The survey was executed effectively and within shorter duration than promised. The data set displays good quality and is well within the requests for the specifications of the project. Ocean Floor Geophysics Inc. (OFG) has been awarded a contract by DEME Group for offshore equipment and personnel to support their project in the Clarion Clipperton Fracture Zone ("CCZF") of the Pacific Ocean in early 2019. 11.09.2018 The Norwegian Petroleum Directorate just concluded a successful three-week data acquisition expedition on the Mohn’s ridge in the western part of the Norwegian Sea. The Mohn’s ridge is a seafloor spreading ridge, separating two oceanic plates, and the objective of the expedition was to investigate the possible existence of mineral resource deposits in this area. The NPD has identified a large area of sulphide minerals, that was previously unknown. The deposits could include important industrial metals such as copper, zinc, cobalt, nickel, vanadium, wolfram and silver. During this year’s expedition, the NPD surveyed an area of 90 km x 35 km centrally located over the spreading ridge, where water depths vary between 1200 and 3500 metres. The expedition was conducted with the Seabed Worker vessel, which is owned by Swire Seabed AS. NPD geologist Jan Stenløkk participated in the voyage. He tells us that the mapping was carried out using an autonomous underwater vehicle, Kongsberg Hugin AUV, which mapped the seabed in long corridors, totalling 750 kilometres. The AUV was equipped with several sensors, including seabed penetrating echo sounders. Other types of data collected include multibeam bathymetry, synthetic aperture sonar data, magnetometry and spontaneous potential field data. The AUV was operated by Ocean Floor Geophysics. “Areas where these data indicated possible mineral deposits were examined using a remote operated vehicle, also known as an ROV, and large volumes of photo and video material were acquired. A number of mineral samples were also collected,” says Stenløkk. The new area of sulphide minerals that was discovered contains many such piles of gravel and collapsed black smokers, including a 26-metre high, non-active tower, in addition to some active systems. The mineral samples taken from these piles of gravel will now undergo several analyses. All mapping data from the AUV sensors will also be processed and interpreted. Mapping area (red square) in the central part of the Mohn ridge in the Norwegian Sea. The map also shows potential areas for seabed minerals such as sulphides and crusts. An OFG Self-Compensating Magnetometer (SCM) system was implemented on a REMUS 100 AUV at Florida Atlantic University and used to conduct field tests for the localisation of subsurface magnetic anomalies, in support of a project in adaptive sensing using multiple AUVs. The work is funded by NSWC-Panama City under the Naval Engineering Education Consortium program. The implementation was carried out by MS ocean engineering student Harryel Philippeaux, under the direction of the project director, Professor Manhar Dhanak. The SCM was mounted on the top of the vehicle (see photo) and ancillary components, including a compass and a PC-104 processing computer, were housed in a custom pressure vessel that served as a payload extension of the AUV. The payload computer hosted the SCM software, a custom localisation algorithm, and a Windows console application that served as ‘middleware’. Preliminary testing in a lake appears to show that the AUV/SCM system is a suitable choice for detection of magnetic anomalies from a mobile platform. 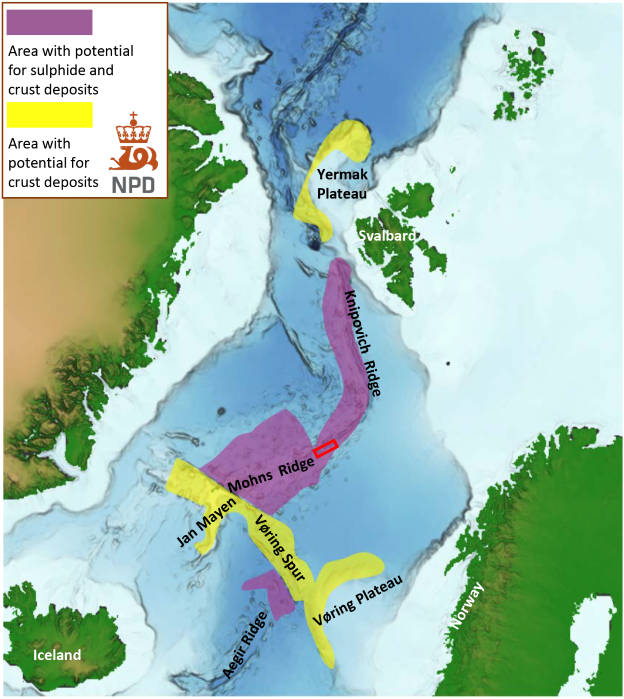 09.08.2018 After the Ministry of Petroleum and Energy assumed administrative responsibility for mineral deposits on the continental shelf, the Norwegian Petroleum Directorate (NPD) has been assigned the task of mapping potential deposits. The area where the mapping will take place is indicated by a yellow square on the map, which also shows the spreading ridge. Ocean Floor Geophysics In. (OFG) is pleased to announce the award of a contract for delivery and installation of two OFG Self-Compensating Magnetometer (SCM) systems to the Department of National Defence’s (DND) science and technology organization, Defence Research and Development Canada (DRDC), under the Built in Canada Innovation Program (BCIP). The systems, which are supplied with a specialised Subsea Processing Unit (SPU), will be installed on a shallow-water IVER Autonomous Underwater Vehicle (AUV) and a 5000m depth-rated ISE Explorer AUV, greatly enhancing the capabilities of the vehicles. The SCM system works by running a simple AUV calibration routine at the beginning of the mission and using it to compute a suite of coefficients that can correct the data in real-time. The software then outputs the raw magnetic vectors and total field as well as the compensated magnetic vectors and total field. The installation of the SCM inside the AUV, or strapped to the hull simplifies AUV operations in many cases when compared to other AUV magnetometer solutions that require towed bodies, long poles in front of the vehicle or de-gaussed hulls. Applications for the SCM cover a wide variety of AUV missions ranging from geological mapping, mine-countermeasures, and vessel signatures, to unexploded ordnance (UXO), and marine archaeology. Teledyne Gavia, manufacturer of the Gavia autonomous underwater vehicle (AUV), has completed trials of the AUV Self-Compensating Magnetometer from Ocean Floor Geophysics (OFG). Following successful integration and field trials in Iceland of the OFG Self-Compensating Magnetometer (SCM) on the Teledyne Gavia AUV the sensor system is now being offered as part of the ever expanding suite of tools available to Gavia users. 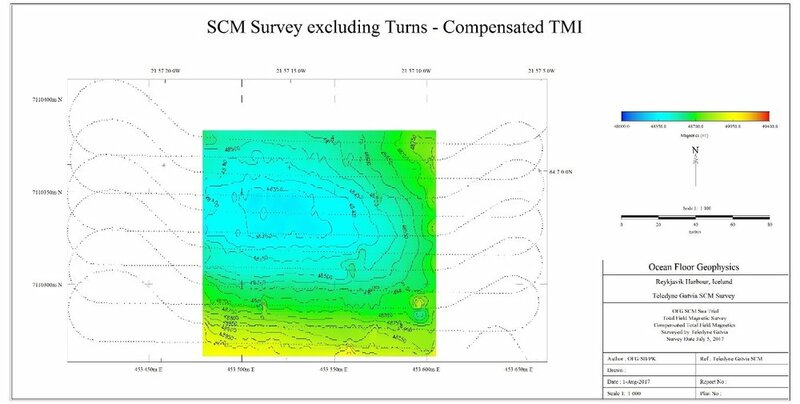 Figure 2: Map of residual compensated Total Magnetic Intensity (TMI) of the same area as previous figure with OFG SCM compensation algorithm applied. Equipping the Gavia with the OFG SCM system for AUVs enables the collection of real-time compensated data that removes the magnetic signature of the AUV ensuring that the ambient field is being measured rather than the AUV itself. Combining the compensated three-vector magnetic data of the SCM with other sensors such as side scan imagery, bathymetric survey data, sub-bottom profiler data, and water chemistry sensors further increases the value of AUV data. The OFG SCM systems for AUVs are being used around world on various applications ranging from geological mapping, mine-countermeasures, and vessel signatures, to unexploded ordnance (UXO), and marine archaeology. Ocean Floor Geophysics Inc. (OFG), in cooperation with Fukada Salvage and Marine Works Co. Ltd. (Fukada), has completed a third high resolution Controlled Source Electromagnetic (CSEM) survey of near surface gas hydrates using the Scripps Institution of Oceanography (Scripps) Vulcan system for the National Institute of Advanced Industrial Science and Technology (AIST) in Japanese waters. Following the successful CSEM surveys and 3D inversion models completed in 2014 and 2015, the 2017 survey comprised over 413 line kilometers of high resolution data collected in depths up to 1640 m from the Fukada vessel Shin Nichi Maru. A 3D inversion of the EM data for the entire 2017 survey area has also been completed and delivered to the client. The Vulcan system is a highly flexible CSEM system capable of a depth of investigation of up to 1 km. This depth of investigation can be increased to a depth of several kilometers with the addition of seafloor receivers. The data processing and inversion workflow uses mature and well tested computer codes developed at Scripps, and at the University of British Columbia. OFG is a world leader in the commercial deployment of deep-water marine electromagnetic systems. OFG in cooperation with Fukada can also now deploy an Autonomous Underwater Vehicle (AUV) based CSEM system that is a complement to the towed Vulcan system for the mapping of gas hydrate deposits and Submarine Massive Sulfide (SMS) deposits. Together, the towed source Vulcan system and the seafloor transmitter based AUV CSEM system provide a tested sea-ready capability to map seafloor resistivities in multiple exploration scenarios. Continued sales of OFG Self-Compensating Magnetometer (SCM) systems to Kongsberg Maritime (KM) for installation on their client's AUVs cement OFG's position as a leading supplier of integrated magnetometer systems for new-build AUVs and retrofits. OFG supplies another AUV Self-Compensating Magnetometer (SCM) system. After successful demonstrations OceanScan-MST of Portugal has placed an order for an OFG SCM for their LAUV. The SCM will be delivered with a Linux version of the OFG on-board real-time compensation software. Ocean Floor Geophysics Inc. (OFG) works with the Shell Ocean Discovery XPRIZE GEBCO-NF Alumni Team to advance the state of the art in autonomous seafloor survey through operations support, expertise, and OFG’s HUGIN Autonomous Underwater Vehicle (AUV) Chercheur. The GEBCO-NF Alumni Team has completed the Technology Readiness Tests of the Shell Ocean Discovery XPRIZE using a combined Unmanned Surface Vessel (USV) and Autonomous Underwater Vehicle (AUV) system. The goal of the XPRIZE challenge is to advance ocean technologies for rapid, unmanned and high-resolution ocean exploration and discovery. This is a world first using the Hugin AUV and a USV mothership for launch, synchronized autonomous AUV survey operations, and recovery of the AUV back in to the USV. The project demonstrated that combined AUV and USV systems are a viable option for future offshore survey and inspection projects. The Team chose to work together with OFG to integrate the HUGIN AUV Chercheur, in to the system. Chercheur is an industry-leading survey and pipeline inspection AUV equipped with a multibeam, camera, sub-bottom profiler, OFG Self Compensating Magnetometer (SCM), water chemistry sensors, and the HISAS 1032, a deep-water interferometric synthetic aperture sonar, that was used to collect bathymetric and imagery data for this project. The USV SEA-KIT Maxlimer was designed by Hushcraft Ltd to act as a surface support vessel for the AUV, including the capacity to launch and recover the AUV and to provide subsea communications and positioning. SEA-KIT is a rugged, impact-safe and self-righting USV that can carry a deployable and retrievable payload of up to 2.5 tons. It has passive motion damping, a stable single-compartment flooding system and a self-deploying and stowing sea anchor to ease and ensure safe operations. The autonomous capabilities of the USV were provided by the K-Mate controller developed by Kongsberg Maritime and the Norwegian Defence Research Establishment (FFI). In addition to the development of the AUV and USV systems used for data acquisition, the Team developed a complete data processing workflow using Teledyne CARIS and ESRI software allowing all the data products to be delivered within 24 hours. The workflow developed was highly automated from data download to delivery of a complete ArcGIS database of the entire survey area, including HiSAS imagery at 4 cm resolution, multibeam bathymetry, interferometric bathymetry and areas of interest reprocessed HiSAS imagery at 2 cm resolution. Autonomous AUV seafloor survey, with an AUV launch and recovery (human-in-the-loop), with the USV autonomously tracking the AUV for a complete survey mission while being monitored from a remote shore station, were demonstrated to be a viable option for future offshore survey and inspection projects. The technology, processes and procedures developed for this project are a big step towards larger scale implementation of these concepts. Ocean Floor Geophysics Inc. (OFG) is a marine geophysics company that provides data acquisition and analysis services that were previously unavailable by combining specialised expertise in subsea operations, sensor design and sensor integration with geophysical technologies beyond the scope of traditional marine geophysical surveys. These include the OFG AUV integrated Cathodic Protection (iCP) system, marine magnetics, EM, and CSEM/MT, deployed by ROV, AUV and deep tow systems. OFG is an advanced user of powerful 2D and 3D EM and magnetic forward modelling and inversion software. This range of technologies and experience allows OFG to support clients from survey design through to data integration and analysis. OFG will provide you with a new perspective on survey and inspection and deliver the data you need to make informed decisions for your projects. The Ocean Floor Geophysics (OFG) AUV team is proud to be part of a world first with the GEBCO-NF Alumni Shell Ocean Discovery XPRIZE team: autonomous seafloor survey with our world class Hugin survey and pipeline inspection AUV "Chercheur". AUV Chercheur was launched from the Unmanned Surface Vessel (USV) Sea-Kit, performed a high resolution seafloor survey with USBL positioning and communications to the USV, and was recovered by the USV. This accomplishment by the GEBCO-NF Alumni team represents a huge stride forward autonomous mapping of the ocean's depths, supported by experts, resources, and equipment from the Nippon Foundation, GEBCO-NF Alumni, Ocean Floor Geophysics, Hushcraft, Kongsberg Maritime, and Teledyne Caris. OFG has been actively involved in seafloor minerals exploration since the formation of the company to support SMS exploration with our patented electromagnetic OFG EM Mk III system. Continuous involvement in seafloor minerals projects all around the world, with a particular focus on SMS deposits, has resulted in the application and development of a wide range of mapping technologies by OFG and our partners. The Asia Pacific Deep Sea Mining Summit in Singapore on November 21 and 22 offers a perfect venue to share some of these advances in mapping techniques ranging from 3D vertical cable seismic to magnetics to a new AUV electromagnetic system. The CEO of OFG, Matthew Kowalczyk, Eng., will be presenting on day 2 of the conference during the Seafloor Mapping Technologies for Deep Sea Mining session. OFG will be presenting the latest AUV electromagnetic system for the efficient mapping of seafloor minerals exploration. The economic and operational advantages of the AUV-borne controlled source electromagnetic (CSEM) system that has been developed and deployed over the last two years will be discussed. Results of the initial tests and development work along with the 3D earth model created from AUV data acquired during the AUV CSEM mapping campaign will also be presented. Matthew Kowalczyk, CEO and Donizeti Carneiro, AUV Business Development Manager will be attending OTC Brasil in Rio de Janeiro from October 24 - 26, 2017 as part of a delegation of Canadian ocean technology companies. Hope to see you there. Looking forward to seeing you there. UMC Sept 24 – 29, Berlin, Germany. "Closed-loop one-way-travel-time navigation using low grade odometry for autonomous underwater vehicles" by Dr. Brian Claus et al. now available online at http://onlinelibrary.wiley.com/doi/10.1002/rob.21746/full . Dr. Karen Weitemeyer is an internationally recognized expert in marine electromagnetic (EM) methods applied to mapping marine gas hydrate deposits. She has over 10 years world-wide experience in the collection, processing, and modelling of marine EM data. She most recently obtained her Professional Geoscientist designation while working for Advisian, WorleyParsons in Calgary, Alberta on a variety of land-based near surface geophysics projects such as contaminate transport and bedrock mapping, reviewing UXO remediation documents, and cross well ERT modelling. Prior to this Karen held a Lectureship in Marine Electromagnetics at the University of Southampton and is currently a visiting researcher. Karen has written and co-authored several scientific papers on marine EM methods applied to mapping gas hydrates. Karen received her PhD in 2008 from the University of California, San Diego while studying at the Marine EM Lab at Scripps Institution of Oceanography. Karen obtained her BSc (Hon) Geophysics in 2003 from the University of British Columbia and is pleased to be returning to British Columbia. OFG is happy to welcome Dr. Brian Claus to the OFG team. His expertise in AUV systems complements OFG's significant AUV capabilities. Dr. Brian Claus has most recently been a post-doctoral scholar at Woods Hole Oceanographic Institute (WHOI) where he investigated cooperative acoustic navigation methods using IVER autonomous underwater vehicles with low grade odometry. Also at WHOI, Dr. Claus validated a magnetic sensing methodology for use on an autonomous underwater glider and investigated methods for extending the operational region of long duration underwater platforms to below 1000 meters. His Doctoral work at Memorial University in Newfoundland, Canada, was on energy efficient navigational methods for long range underwater vehicles in surface denied regions for which he received his Ph.D in 2015. He has worked extensively with underwater gliders, including the design of an auxiliary glider propulsion system which is often called a Hybrid Glider which was the subject of his Masters Thesis. Dr. Claus completed his Masters degree in Engineering from Memorial University in 2010 and an Electrical Engineering degree from the University of Victoria in 2008.